This beautiful Clematis bears raspberry-pink flowers with a darker pink stripe, fading to white at the edges of the petals and red centres during May and June and then again in September. 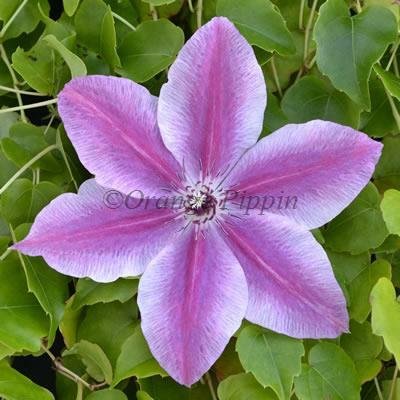 Clematis 'Carnaby' is a neat growing variety which can be grown against a trellis, wall or planted in a container trained up bamboo canes or an obelisk on the patio. Clematis 'Carnaby' was raised in the United States by an unknown person and was introduced to the UK in 1983 by Treasures of Tenbury, England.